As Kenny Chesney puts it, “Everything gets hotter when the sun goes down.” We all work hard at washing, wiping, shining and waxing our boats to give them their best appearance during the day. But what about nighttime? At anchor in the pitch black, when all you see around is the nav lights of nearby vessels, you simply flip a rocker switch and a beacon of crystal blue illuminates from under your swim platform. All the other boaters wish they had taken a few hours and installed their own lights, as you welcome them aboard for the evening activities. I used to be like everyone else — until I decided to hook up some underwater lights. At first glance, this project seemed a bit intimidating. Drilling holes in the transom and rewiring my Corsa Marine offshore powerboat wasn’t appealing. After I consulted a few fellow boaters and people at a couple of local marinas, the chances of doing this myself increased, and the vision of my boat illuminated in the darkness inspired me to proceed. Looking back, it really wasn’t that difficult, and the results are amazing. Unleashed is hotter when the sun goes down. Before I could install the lights on my boat, I needed to decide which ones to use. If you haven’t looked at lights recently (or ever), you will find a wide range of underwater illumination available. The prices range from as low as $200 to more than $1,000. 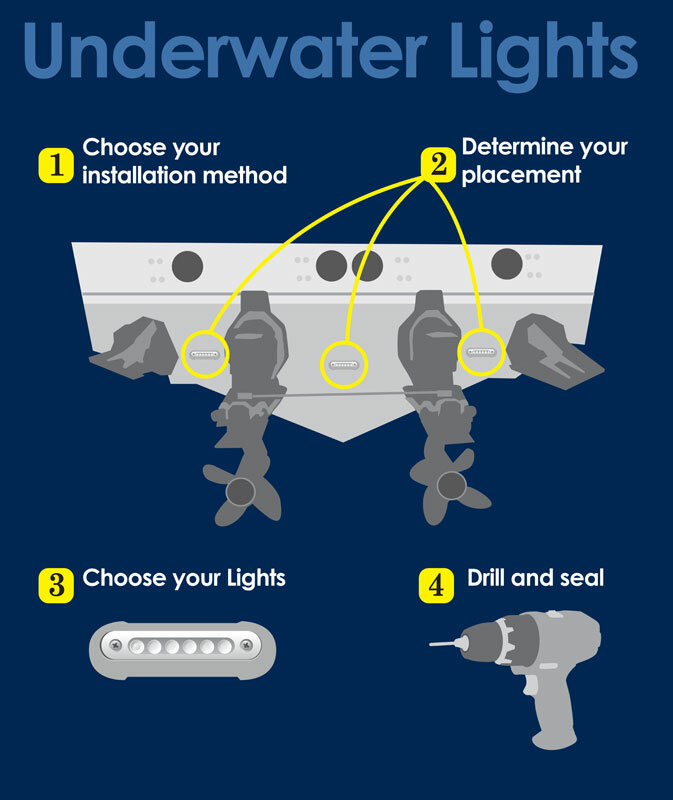 The lights I settled on were from Attwood: LED 5-inch stainless steel underwater lights. I had a choice of white, green or blue LEDs, and I purchased the blue ones through a local marina for $250 each (though I later found the same lights for $180). Since I have twin engines, I decided to install three lights, mounting two on the outside of the drives and one in between. There are basically three ways to install the lights. You can go with a through-hull model, a mounted puck with the wire being the only thing that goes through the hull, or a true surface-mount light where the feed wire goes up the transom on the exterior of the vessel and then into the boat above the waterline. I chose the surface-puck option with the wires going through the hull. I like to keep as little as possible running up the outside of the transom, and I thought the through-hull light was too big of a hole to tackle. The puck only required a 1/8-inch hole, and I thought I would be able to seal up a hole that size. Make sure you read the instructions that come with whichever lights you decide to purchase, but you can bet the installation will be similar to mine. First, you have to pick the correct height for the puck. The best placement allows for the brightest lighting. Keep the pucks away from the drives and the trim tabs. I placed mine in the middle, two between the drives and tabs and one between the drives. Also, the light should not be placed so deep that you lose the crystal-blue effect. The back of my boat has a deep V, so the center puck was placed a little lower to keep it in the water while the boat is under way. Next, you have to drill the hole for the lead wire, which is in the center of the horizontal puck. Also, you will need to drill two additional holes for the screws that hold the light in place. Once you fish the lead wire through the hole into the inside of the engine compartment, place a liberal amount of marine-grade sealant around the wire and on the back of the light. You will want to seal the screw holes, too. I also used sealant on the inside of the transom to keep moisture out. The inside wiring is as simple as connecting positive to positive and negative to negative; I found a ground near the front of the engine compartment. I decided to have a dedicated rocker switch for the underwater lights, so I can have them on by themselves if we’re at the dock. I ran a positive wire to the rocker switch and installed a 3-amp inline fuse (one amp for each light), and then I ran a positive wire from the instrument panel to the lights. Keep the wiring simple, but don’t take shortcuts. Use zip ties to keep them tidy. • Determine a budget and then increase it a little. I plan on adding three more lights, especially since I found the discounted ones. • Don’t buy the cheapest ones. You’ll be disappointed — if not at first, then later — with the weak warranty, if you have any trouble. • Go with a brand recommended by local dealers. They have the contacts to take care of any issues and have a track record with the brand. Finally, place your boat in the water and flip the toggle. When the sun goes down, you’ll be ready for the hot times.